Why do I think that Mark Jackson is one of the most interesting basketball figures of my life time, despite the fact I've never really been a big fan of any team he played on? Let me count the reasons! But seriously, think about it: Mark Jackson is one of only four players ever to have more than 10,000 assists. 3. When I was growing up, I played a lot of church league basketball with Pittsburgh Pirates (first place!) pitcher Bob Walk's son. First let me say, Bob Walk was one of the nicest dudes I ever met. Anyway, the younger Walk and his best friend were obsessed with the Indiana Pacers to the extent that they would pretend (even in real games!) to be Mark Jackson and Reggie Miller. This was pretty easy for them to do actually. Mark Jackson had such an awesome free throw routine and consistent style of hair and dress that it made him easy to copy no matter how many times he was traded or became a free agent (nine times for those who are wondering.) The Reggie Miller kid focused obsessively on shooting threes with his knees apart and with his socks pulled high. One time they asked me to become their Rik Smits, but it sounded too dorky, so I passed. Still, we won a lot of games with those copycats as our back court. 4. Jackson was so New York. Once, Jackson said during a live broadcast his favorite movie growing up was The Taking of Pelham 123! [Ed. note: not the remake, either!] Born in Brooklyn, Jackson played for St. John's University when the program likely mattered the most nationwide, performing as the quintessential clever Big East point guard, and once graduating, he played for two distinct Knicks teams with a ten year break in service. And speaking of which, how sweet was Big East basketball in the 1980s? 5. By the standards of contemporary NBA players, Jackson was out of shape. One might even consider his physique "flubby." At least once Jackson was benched for fitness issues. He didn't exactly look like you expect a guard to look like, but was such a creative player he'd always earn more playing time. I've always sort of rooted for guys who don't look like an Adonis. 6. He perfected the teardrop/floater that other players have widely copied since. It has become a much more widely used shot in the era of cramped lanes and "long" defenders. I'm sure it had been around in many forms over the years, but Mark Jackson is the guy that comes to mind as hitting the tear drop growing up. 7. He had a rule informally named after him (the five second back-to-the-basket rule.) I remember entire possessions that consisted solely of Mark Jackson backing down a defender before taking a nearly point blank baby hook. For a while, I thought of it as the "Charles Barkley" rule, but "charles barkley rule" on Google only brings up 1,510 results compared to 3,790 for "mark jackson rule." 8. Over the course of his announcing career, Jeff Van Gundy and Jackson have become the announcer embodiment of a black cop/white cop buddy movie, to my frequent amusement. I can only hope his coaching career will be equally entertaining for me (in at least some sense). Put it all together: Mark Jackson was a comparatively small and non-athletic man, largely informed by a street game, who managed to use a few moves over and over again to put up much better numbers than he 'should' have. The combination of the back down, the baby hook, the no-look passes, the teardrop, and the push shot made him one of the most frustrating point guards of his era, even if he never had the ability to be a true star. Basically he played basketball the way some people play video games: exploiting a weakness in your opponent and doing it over and over again. Video game people call it "cheesing," amongst other things. In real pro basketball, I consider it "smart." Okay, I'm sold. But why "Jackson Pollack"? Because Pollack was also a limited artist who resorted over and over again to a few tricks that others would have considered cheesing? Or is it a reference to the myriad connections both have/had with New York and California? Or has Mark Jackson developed a severe alcohol problem and an affinity for Oldsmobiles? The first! The master of a few tricks. Plus their names both have "Jackson" in it and I had no better idea for a title for a piece about a player. 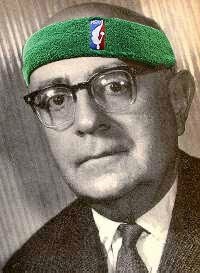 The Mark Rothko point guard.